Need a shopping trolley? Spanish company Rolser have got it in the bag. Dedicated to creating innovative products that make your day-to-day life easier, Rolser’s shopping trolleys are cleverly designed so that hauling your new purchases back home is a breeze. The Saquet Shopping Trolley is collapsible, with easy click-in mechanics that release your trolley base and folds away once you’re done. 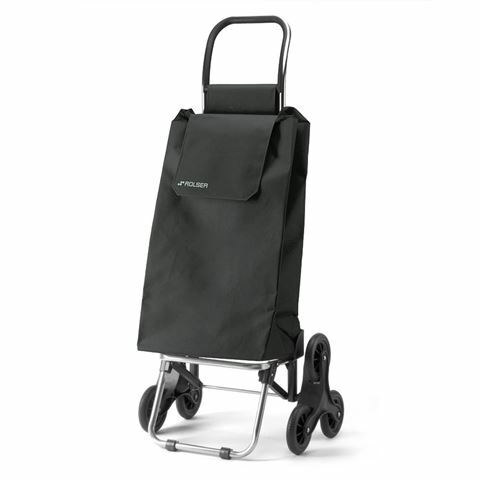 It has a huge capacity for your groceries, and won't give way under their weight, even when full. Support at the front means it won’t roll away on a whim, and a gentle tilt action will have the trolley running smoothly on its durable wheels, so you can control it every step of the way. And last but not least, three wheels on each side make going up and down stairs and ramps laughable. Very lightweight aluminium and plastic frame. Generous main capacity with drawstring closure. Support at front of base to prevent rolling. Six large wheels for ease of movement, including up and down stairs and ramps. Recommended maximum load of 25kg. Dimensions: 105 x 34 x 38cm (measured from the wheels to the top of the handle).